The scent diffuses through 3 sola flowers, made one at a time, by skilled artisans using the dried peel of the sola plant that is sewn onto a cotton wick. In keeping with the Agraria definition of “from the earth”, sola flowers are a natural material and environmentally friendly. As the perfumed essential oils are absorbed through the cotton wick, the petals will change to the color of the oil and the bouquet will stay fragrant up to one year. 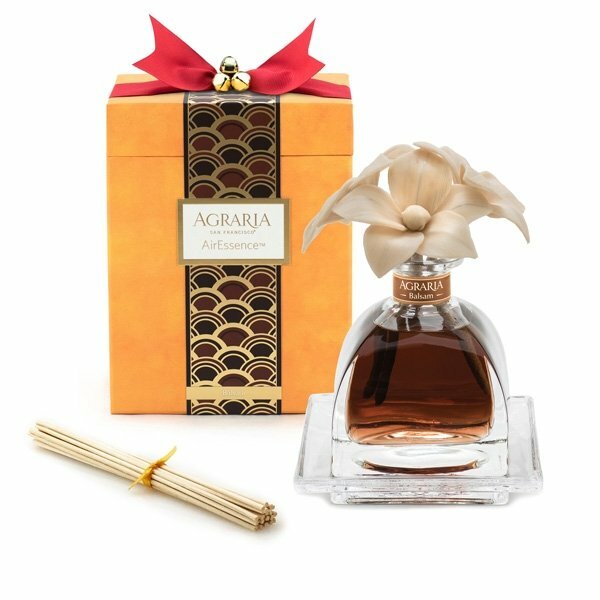 As an alternative to the sola flowers, 20 Diffuser Reeds are also included, as well as a glass tray, all nestled in a gold foil-lined gift box.